Star Maps and Our Journey to the Heart: Reconstructing Our Biigtigong Verb Paradigms is our story of our reconstruction of the ways of our verbs. Verbs are the heart of our Biigtigong language, and Star Maps is a story of our collective journey to that very place – to the heart of our language. It is a story of our gratitude and happiness for our having been able to rebuild and rediscover the many patterns and ways of the verbs of our Biigtigong Nishnaabe language. It is a story of our appreciation for our having been able to successfully utilize techniques of ‘grammar bridging’ between, on the one hand, the patterns and ways of Wdaawaa verbs and Potawatomi verbs, to, on the other hand, the ways and patterns of our Biigtigong Wjibwe verbs. Star Maps is a story of our respect and thankfulness for the contributions of 19 Biigtigong elders who are responsible for our now knowing the star maps – the constellations, the patterns, the charts – of our Biigtigong verbs. Star Maps is our story of our reconstruction of our Biigtigong verb paradigms. We are happy to be able to share our story with you. Montano, John Paul. 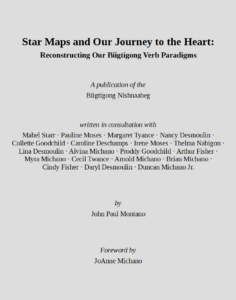 “Star Maps and Our Journey to the Heart: Reconstructing Biigtigong’s Verb Paradigms” biigtigong.com. 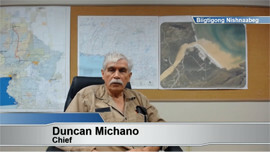 Biigtigong Nishnaabeg, 17 May 2017. Web.